Eggs Benedict; A good way to start the day, so might as well serve as the start to our blog. Having spent a little time in Pokhara, we had managed to track down all of the essentials – like where to get a damn good breakfast overlooking Lake Phewa. This was the first town that we’d spent any length of time in since the start of the trip that had not been enforced by hospital visits, truck shipping, or vehicle repair. It had been good fun, but now it was time to try something new. As luck would have it, it was nearly time for our next trek. We were feeling pretty good straight off the back of our Manaslu adventure, we’d kept up the biking since we’d been back in town and managed to get some rest in too. Today we’d just be tending to Ivor (as ever, he’s a needy little soul), and readying ourselves for another 10 day stint in the mountains. We met with Jagan (owner of www.PokharaMountainBike.com, who we had booked the next trek with), did a little bike spannering, picked up some supplies, and Kim went off to get a haircut from a slightly crazy German lady who was financing her near endless travelling by snipping her way around the world. Packing was a little easier for this trip since we had the luxury of a porter to carry a bag for us between rest stops included with our tour. Jagan arranged for us to go out for Indian food that night, and booked us a hotel that night so that we could get ourselves in order without having to sleep in Ivor – This came in handy as, rather predictably, we’d left all of our packing until long after nightfall. 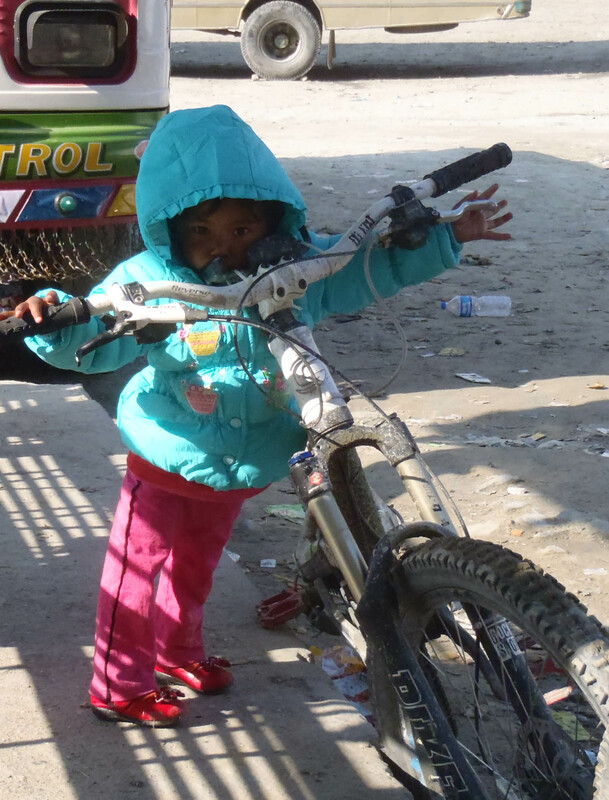 Wowsers, early rising today – by 6am we were outside Jagan’s shop, meeting Santoram (our guide for the next 10 days), and dismantling our bikes so that they could be loaded into / onto the tiny Suzuki swift that would taxi us to Pokhara airport. We boarded the 20 seater air-taxi for the 45 minute hop up the valley to Jomsom, where we would start our trip up towards the Mustang region of the Himalayas. The plane weaved its way through the valleys for the duration of the flight. It was a first for us to be able to look up at the scenery from inside a plane – such is the grandeur of the Annapurna range that we would traverse the mighty peaks rather than cross them. The door to the cockpit had been left open, so we were treated an unusual view; flying directly towards snowy mountains, traditionally something that pilots should endeavour to avoid. We were still standing on the tiny airstrip at Jomsom as our bikes and bags were unloaded. Stopping in at a hotel up the road from the terminal ( / hut) we put our bikes back together between mouthfuls of porridge and slurps of coffee. The ride for the day was an easy one, since we only had to cruise up the valley to Kegbeni– we again had to acclimatise to the altitude before pushing further up into the mountains. Weaving across the wide valley floor as we climbed along the route of the river Kali Gandaki, the trail was mainly jeep track with the negotiation of a few rivers crossings being the only real difficulty. Kim dipped her feet in a couple of times when her bike stalled on the rocky riverbead, soaking her cycling shoes in glacier fed water was not the ideal way to start a 10 day biking trip – but we made it to the rest stop for the night in such good time that we could put our stuff out to dry in the sunlight. The scenery was very different to the alpine style region of the Manaslu circuit – the valley was almost completely free of vegetation, and the valley much wider than those we had seen elsewhere in the region. Since it was dry season, we could take routes close to the valley floor all day, and barely had to gain any altitude after the flight to Jomsom – the plane had done all of the hard work for us. On the face of it, today should be the hardest of our Mustang adventure. We’d gained over a kilometre in height by lunch, but the conditions on the trail were so good that it had not been the challenge we feared. The wide jeep trail traversed up the valley wall to Muktinath, the last stop before the Tharong La pass on the Annapurna trekking circuit. We took a break at the small town of Jargot on route so that we could take a look inside a Monastery – from the roof there were some awe inspiring views of the Mountain-scape that now surrounded us. 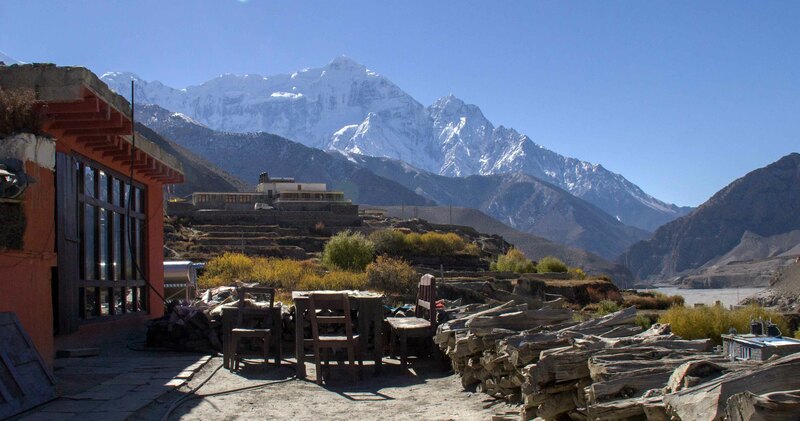 Having been adjusted to the trekking way by the brutality of Manaslu, we made good time again – arriving at our destination for the evening in time for a late lunch. Even despite the altitude (now at 3700m) we still had enough energy left to wheel the bikes out again for an afternoon scoping out some technical trails heading back down to Jargot that we’d spotted from our long jeep track climb. After a couple of laps (pushing up, riding down) we headed back to the tea hut, saving some energy for the huge descent that would be waiting for us after tomorrow morning’s porridge. The tea houses in this area were far more luxurious than those we had experienced before, and resembled mini-hotels really. Some even boasted hot running water – imagine that! Being serviced by jeep track rather than donkey train had brought them on leaps and bounds, though they perhaps lacked some of the charm of the lesser used spots. Even in these posh huts, one thing that could not be changed was the cold – the efforts of a small strip bar heater were wasted against the freezing wind that shot up the valley, but we all huddled around it nevertheless – it certainly encouraged us to mingle with other trekkers who, for the most part, had just completed the pass; the greatest challenge on the Annapurna circuit. Today can be simplified in the style of a maths test for dummies: If Kim and Vaughan start off with 3700 meters under their belts, and only have to gain 300 more before descending to Jomsom, at 2730, how much of the day will they spend freewheeling, and grinning like idiots? We rode in a group with another couple from Slovenia, who were also on a trek organised by the same Pokhara outfit. We slogged our way up the incline leaving Muktinath in the direction of Larpa that took us over a ridgeline that just pushed the 4000 meter mark, from then on it was almost all downhill. Contouring down the far edge of the ridge we were treated to loose rocks and dusty switchbacks, then the true ‘freeride section’ of the day would begin. Santoram pointed out clumps of vegetation in the distance, or perhaps a pile of rocks, and we would weave our way towards them through the lunar landscape in any route of our choosing. The closest thing to off-piste that we will ever get as mountain bikers. Nearing a rise, Don (the other guide) herded us all together and gave some specific instructions for the next section, waving his hand to the left, advising us of a 300 meter sudden drop to that side. Needless to say, no one even strayed slightly in that direction – the only victim to that section of trail was Vaughan’s rear inner tube, which had gotten all too close to some spiky plant life. We lost the remainder of the day’s altitude with the aid of some flowing singletrack on a shallow enough gradient that it was safe to let go of the brakes (Kim kept her’s on as usual) and just let the bike drift as we snaked down to the village of Ekla Bhatti below. With hot tea and a snack inside us, and plenty of time before dark we pushed back up the last section, played around taking photos, and used up most of our remaining energy before the final cruise to Jomsom along the valley floor. Without too far to cover down the valley to our night stop of Marpha, the length of the day was really down to us – deciding how much we would weave up and down the valley walls, and with Santoram’s help, searching out the more interesting riding trails. Our route took us past a Buddhist Gompa ( / Stupa / Temple) where we took a break after one hard climb. From here we could see one of the flights coming out from the Jomsom airstrip, and flying out below us. The loose shale made for interesting riding, particularly in a few sections where the sheer drops to the valley floor were a little too close for comfort. You can just about see the faint trace of our trail coming down diagonally left to right. No wonder we felt timid. The village of Marpha is apparently well known for its apples. Good news for us since it meant apple pies and crumble to recoup on calories burned during the day. That evening we sat in on a celebration where all the male elders of the village came together, since it was soon time for them to head down the valley to avoid the onset of winter. Santoram told us that in a couple of week’s time, it would be a ghost town save for the few people that stayed behind to tend to livestock. It was funny seeing the old gentlemen tucking into the platters of western ‘exotic’ foods such as pizza and spring rolls that were available at the guesthouse restaurant – It is rare to see the Nepalese veer away from their staple of Dhal Bhat (rice with lentil curry). We played cards at a table in the corner, and the village gents waited around a TV set since it had recently been the election, and the results were starting to come in. Following on a similar theme to yesterday, we were porridge fueled and on the trail for a gentile 9am. We crossed the valley from Marpha, and made our way through some tiny villages on our way to Larjung, our stop for the night. We had exhausted Santoram’s knowledge of the local trails by early afternoon, so we checked into our lodging, quaffed a hot chocolate and set out to follow a loop trail that we’d noticed on our GPS. It was another slog of a climb, but it skirted back though some fun singletrack, and we got to see another small village perched up on a rocky outcrop that we would have otherwise missed. Vaughan’s body was making complaints that pointed towards having picked up another bug or another (as is common in these remote areas), so it was an extra early night for us in the hope that he could see the back of it by the morning. Though not back to full force, Vaughan was definitely whinging less – in trekking terms this is close enough to a complete recovery that it can be ignored from this point forth. Out on the trails, we climbed the same path that we had done the previous day on our extracurricular path finding, but this time we carried on up the hill past the village before taking a different descent. A nice section of trail with switchbacks leading back to river level – that was for those of us lucky enough to be riding without a pair of children from the village in hot pursuit. The kids were chasing the scent of candy – something they obviously associate with us pale tourist folk. Kim cracked under the pressure of the chase and took a small tumble. Nothing wounded other than her pride, and fortunately our stocks of confectionery were also still intact. It was a tough day, with enough trips up and down the valley walls to make the final climb up to our lodge in Kalopani a struggle. We were only too happy to make use of the luxurious hot running water for a shower that was probably longer overdue than we want to admit right now. Today was another ‘big drop’ day. At least 1000 meters of down without too much ascent, the route was narrow, rocky, and steep for the most part. We picked our way through rock gardens and down sheer flights of steps for the whole morning, and arrived in Tatopani early in the afternoon. We were still excited for riding, but our forearms had taken a beating from clinging to the bars on the downhill so we opted for a relaxed afternoon in town. Having dropped so far the climate had changed considerably – the bare rock faces had been replaced with fruit groves, and there was now a tropical feel to the place. We came upon a group of travellers who’d already hunted out the only happy hour in the village – cheap beer, and free popcorn. We were in luck, since the happy ‘hour’ did not come to an end, and we whiled away the rest of the afternoon with the ramshackle company of trekkers from all different backgrounds, age groups, and nationalities. Someone had managed to rent a guitar from a villager, and we aligned ourselves with the traveller cliché in all ways possible – probably even murmuring along a Bob Marley song or two along the way. We all ended up at the town’s natural hot springs later, in an attempt to ease away the aches and pains from our respective activities. In the melting pot were hikers, bikers, and kayakers – but the heat was too much to stand for more than 10 or 15 minutes. The place shut at 9pm, and even after a long walk round (our guesthouse had inexplicably locked its gate), we were uncomfortably warm for some time after. A long pedal along jeep track today – to get to the town of Beni, from where we could catch a bus back towards Pokhara, alight a little early and ride up the remainder of Sarangkot (the hill overlooking town), where we would stay for the night. The riding was nothing to inspirational, but with fitness gained from the last few weeks made the morning’s ride in an hour and a half – Vaughan was even feeling plucky enough to take on a race with a couple of keen locals on a motorcycle, the rough downhills playing into his hands for a decisive victory. After the confused waiting that accompanies every form of public transport in every country that is still finding its feet, our bikes were loaded onto the roof of a public bus, and we were squeezed onboard. We bounced our way to the destination along roads that had worrying large sections missing due to landslides. Another long jeep track for the afternoon, though this one pointed predominately skywards. We stopped in at the guesthouse, chatted to another guest – A guy from France also working the conge sabattique to his advantage – and then got an early night. The next morning would be an early one since we were going to try to catch the sunrise over the Annapurna range from the top of Sarangkot. We rose at an ungodly hour, so that we could witness the sun attempting to drag itself free from its comfortable cloudy duvet. Going by the host of SLR wielding revellers it was a well known sunrise spot for those staying in Pokhara. We were treated to some glorious views over the valley, and despite only catching a brief glimpse of the pink morning light on the snowy peaks before cloud once again enveloped them, it was worth the early rise for sure. One last morning of the trekking routine of porridge for breakfast, and after that we had a nice descent back to lake Phewa, a horrific 800m climb to the Peace Pagoda on the far side of the valley, and finally a ride back to town on wooded singletrack that we had now done twice before. We spent the afternoon in town, searched out a cheese board that had become infamous by the ramblings of Mark and Jim a couple of weeks ago, and decided to give our legs a rest by taking the next day off of bikes. Take everything out of the ‘garage’ in the cabin. A bottle of coolant had given up and let its contents roam free amongst our sporting goods and spare truck parts. Stop the cab heater from dripping coolant onto our feet and making the carpet soggy. The guy living across the road was a friendly Scot who’d been living in Nepal for about 17 years – he knew a good mechanic who could help get the brackets made, and then we got on with the rest of our exciting to-do list. Ivor granted us the evening off, so we met up with our fellow sabbatical taker Fabien (from the Saringkot guesthouse) for pizza and drinks in town. 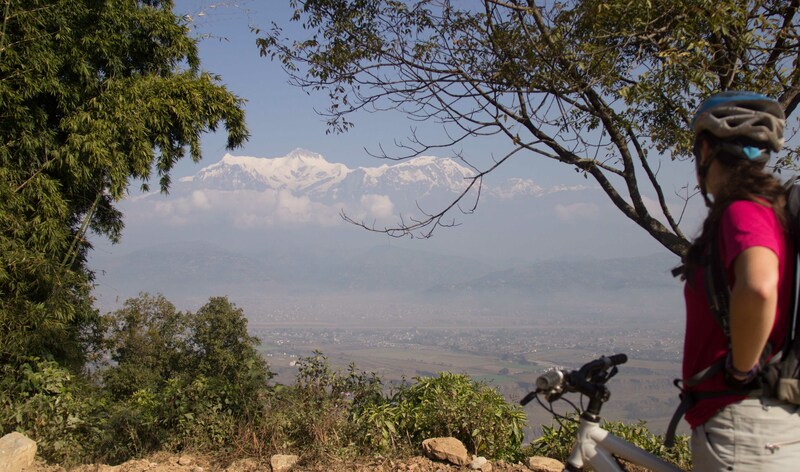 We were still owed a few days of riding in the Pokhara valley as part of our tour, so were again up early and out for a pedal. This time we would be joined by Pete, an English guy who was volunteering to work for Jagan. He’d been doing some overlanding of his own, and other than a couple of short flights had cycled all of the way to Nepal from the UK – Him and his missus blog their efforts too… www.McNeilsOnWheels.com if you’re interested. The ride would take us in the footsteps of good old Prince Charlie – along what is now known as the royal trek. We’d visited the area before, but on Royal Enfields rather than our pedal cycles. The ride was none too technical, but it got our legs spinning, and it was good to be out. We returned to town with just enough time to grab a quick shower and then jump in a cab to go and check on the progress of our brackets for Ivor – Unfortunately, the mechanic had not interpreted the technical drawing quite correctly and we would need some more holes drilled. It was power cut time, so we would have to return to collect them tomorrow. 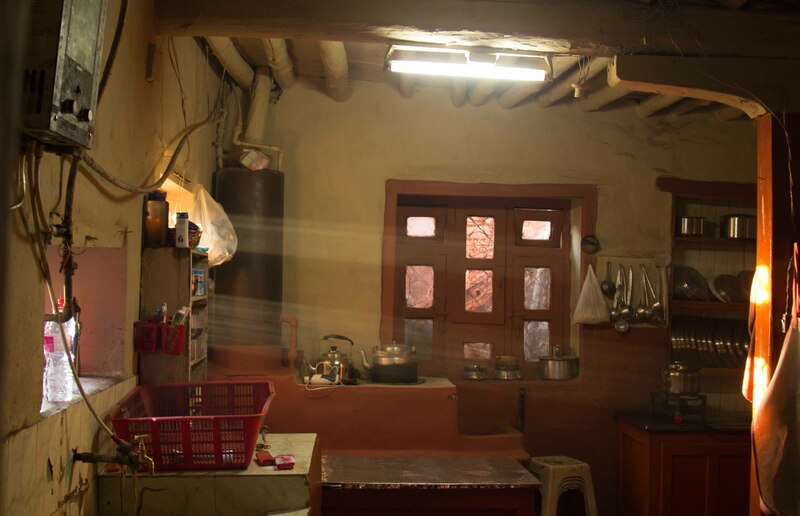 In case ‘power cut time’ sounds like a bizarre concept, perhaps it deserves a few lines by means of explanation – in Nepal they have a huge amount of potential for hydro electric power, second only to Brazil in the world in this respect, but unfortunately so far, they lack the infrastructure needed to effectively harness it. As such, in rainy season they have the luxury of power on demand, but through out the rest of the year to match the demand to the supply they have scheduled power outages, ranging from just a few hours a day just after the rains, to a massive 14 hours a day in the dry spells. Another bright and early start – we were keen to get a ride in during the morning and then see to some Ivor TLC in the afternoon. We’d head north out of Pokhara to weave our way up a different hill. On route we were treated to a display from a whole host of eagles that were soaring along the contours of the same hill in search of thermals – and they passed incredibly close to us. The climb was worth the effort, both for the views and for the technical descent. Santoram confessed on not really knowing his way down this part of the hill and navigating mainly by feel. But in doing so he managed to uncover some superb riding for us. We collected our metalwork from our man at the garage, and although it still wasn’t quite as per the sketch, it was at least something we could work with. That night we dropped by at John’s place (the friendly Scot) and shared a few beers with him, his Nepali wife, and another couple of John’s friends who were Brits that had settled in India for 6 months every year. They had just popped up for a visit, and to pick up their van that they had left with the same mechanic we had used whole getting some work done on it. They had some great stories, both from their days overlanding in an old bus, and from their new lives settled in these interesting and challenging countries. After a quick fit check of our new bracketry, we slapped a first coat of paint on them, and headed down to Jagan’s shop for our last day of riding in the Pokhara Valley. We headed out with Santoram, and since they run a weekly ride where local kids can go out for free, we had two young Nepali guys with us too. We put in quite a few miles, but it was mainly on road and smooth jeep track. For our last day it was nice not to have anything too taxing, and we still had plenty of business to attend to back in town. We painted, Christmas shopped, and re-repaired the leak of coolant in the cab that still wasn’t quite right. After the sun went down, and we could no longer wield spanners effectively we set about some internet tasks that were getting steadily more overdue at a restaurant in town. We had a message from a friend of ours from the UK, Mike, asking where we would be in a couple of weeks since he’d got some holiday allowance to burn before the end of the year. Originally thinking that we would be involved with the dreaded shipping companies once more, trying to send Ivor back on his way to Malaysia, we dismissed the idea. It wasn’t long after that we started questioning the wisdom of rushing to Kolkata, dealing with the hateful shipping, and potentially running out of time to get Ivor cleared the other end, and find secure parking for him before our flights out of Malaysia to Australia – which we had booked for the 23rd. Surely it made more sense to find somewhere safe for our truck with the friendly Nepalese, don our backpacks and meet Mike somewhere for a couple of weeks before departing to Oz for Chistmas? We had a chat with him and shortlisted Indonesia, Thailand, and Sri Lanka for a short holiday from our travels. So we readied ourselves to leave town – booking bus tickets to Kathmandu for Tuesday, and doing the last finishing touches to Ivor so that he could be left in a good state, and would be raring to go on our return. The one problem was that we still did not have a fixed destination – our various flight searches had not shown enough of a difference between our choices to rule any of them out. It would have to come down to Mike writing the candidates onto paper, and selecting one from a hat: Thailand it was then. Now we had the task of finding somewhere safe for our beloved Ivor for 7 weeks while we became backpackers. We drove to the Mechanic, and to our disbelief he not only agreed, but said that he did not want any money for the service! He lived on site, and locked the big gates to the compound every evening so it was perfect. We gave the truck a bit of a drive since he’d been sat still for a long time already, and another 7 weeks was a bit too much to ask without blowing off the cobwebs first, as it were. The 600 meter climb up to the Peace Pagoda would do the trick, with the added bonus of a view over the town backdropped by the Annapurna range that were standing proud and clear in the distance, somehow looking even grander with the town and Sarangkot in front for them to tower over. And all of this panorama could even be accompanied by a small tub of ice cream from the restaurant up there, if one so desired (and these ones most certainly did). It was a fitting way to say our goodbyes to a town and an area that we’d enjoyed so much, it’s true that we would be back in January but we figured that would be just a dash to get the truck before hitting the road again. Ouchy – was it 5:30am or even earlier? We can’t quite remember, but it was with bleary eyes that we shoveled our chosen items into our backpacks, tidied the last few bits, packed up Ivor, and set off to find Shrikanta our friendly mechanic. After a few unanswered phone calls, and some nervous clock watching as the time for our bus’s departure grew closer, Shrikanta unlocked the gates and Vaughan could shuffle Ivor into his new home while Kim flagged down a taxi so that we could rush straight to the bus station. We arrived with enough time for a few sips of coffee before our bus started pulling away and heading towards the capital. We had been told that the bus would leave in 10 minutes, but alas we hadn’t realised that “10 minutes” was the only unit of time the bus conductor knew in English, and he actually meant “We’re about to go”. Tracking down the hotel we’d booked was surprisingly easy in the ramshackle streets of Kathmandu, and after some great shawarmas for a late lunch, we managed to meet up with Ajay (the Nepali MTB Champ who joined us on the Manaslu trek) to exchange some photos from our adventure. So we had a limited to do list for the day, but the task that would have no doubt featured emboldened text, and quite possibly the odd underline or two was Get To Kathmandu International Terminal On Time. But before tackling the biggy, we’d get down to the matter of dispatching Christmas gifts to our loved ones – still not a trivial issue in itself (and therefore still deserving some kind of highlight in the list, perhaps a star next to it? *). Nepal being Nepal, this would not be the simplistic task that we were used to from our lives way out west. The first step would be to go to the DHL shop, which was closed. It then involved being lead through some tiny corridors and stairways that arrived at a hustlers office – who claimed to be able to dispatch our parcel cheaply, and still with a legitimate courier. Smelling a rat, we made our excuses and left – instead choosing to call the number that we’d just noticed on the genuine DHL shop window. No problem, our man would arrive in 10 minutes. After a good telling off for abandoning his post, the friendly chap showed up but gave us a horrifying quote. His lack of professionalism would soon come in handy though, as he kindly steered us towards the Nepal postal service saying that they would cost less than half that of DHL. With a desperate haggle we secured a taxi ride to the post office, to find all the buildings unsigned, and every corner of the place to be in absolute chaos. The security guards seemed to have the measure of the process and directed us towards the necessary building within the complex so that the real fun of customs and dispatch could begin. The likelihood of this package arriving at all seemed pretty doubtful, and any hope of it getting there in a timely fashion was all but lost. We were confronted with a barrage of paperwork, a seamstress, and a customs official wielding a brass stamp, wax seal, and a naked flame. We have neither the time nor the patience to recount the tale blow by blow, but by the end of it our package had been checked, hand sewn within a cloth lining, and each seam had been stamped by the customs officer. When you realise that this happens to every single package that leaves Nepal in the hands of the national postal service, it is a striking lesson into the inefficiency that can be tolerated by a business when the wage is low enough to make it insignificant. We should mention, in defense of the system, that the parcels arrived in tact, and well in time for Christmas – congrats Nepal, you surprised us both! Phewph, that was a pain, but still not managed to endanger our main job for the day: get our butts on that plane to Malaysia. One final taxi driver haggle, and we would be on our way – saying farewell to Nepal and setting off in search of a last minute Thai adventure, and a festive break down under – both absolutely, positively convinced that we’d made the right choice in leaving Ivor in the capable hands of Shrikanta as opposed to the torment that would have been international shipping in a rush before Christmas. – How will our adventurers fair up against the wrath of the Thai beverage which can only be translated as ‘Fire Water’? – Will the missing telephone, hat, memories, and broken sink ever be conclusively linked to the above, and will any of them be recovered? – Just how long will it take to remove Ben’s stricken pickup truck from a section of deep bog not far outside Melbourne? – How will Becky and Matt cope when they find their house occupied by squatters on their return from Christmas break? – What is it with referring to people here without having properly introduced them in the blog, isn’t that a little uncouth? All this and more to be revealed in the next enthralling episodes….